Most of you know my thoughts on this, so no point beating a dead horse. It makes no financial sense to keep the game running as is "just because." I am willing to help the game last until August 7th so it can die with honour. That much it deserves at the very least. I would love to see SFO to stick around but its just not competitive. There are so many other fighting games nowadays that can be played on the pc online against other players. Street fighter, KOF, Mortal Kombat, Marvel Veruss Capcom, Tekken. Why should a new player play a 2001 Browser based, laggy as heck fighting game? The only thing it has going for it is that its free while the others you have to pay full price but that full price is worth it. I dont know about the other games but have you guys played Tekken 7? That chiz is good man it locks at 60 fps the vast majority of the time and has an amazingly deep combat system, yes people spam but you get owned by spam only when you havn't gone into practice mode and practiced over and over how to deal with that spam. In SFO the game is based on spam (which actually makes it unique and stand out in my mind) but you can only do so much against that spam because the lag and "warping" and hits not registering limits the defensive and offensive options that you have. SFO simply does not have enough cards on the table for someone to want to play it rather than the other games, the big titles and even smaller titles get people playing them because they have more to offer. For me for SFO to survive you have to give compelling reasons for people to say "hey i'll play that instead!" This a spam post (prolly) but eff it. we might have to let SFO go. The thread has been cleaned. There are existing threads for legacies and personal achievements. Utilize those if you want to talk about your legacy. Bahki, Usurp, and Shadow R., thank you for your support. To everyone still here helping in some way, thank you as well. To tell you the truth, I don't know where we go from here. I have no answers, no suggestions. Hit the kill switch now. Slash, Burn and rebuild. You are missing the point. At this point SFO CANNOT survive, our last chance was when we hyped up 2.0 that only ended up being the same game. (on its initial release there were almost 20+ people in the server for around a 2-3 week period). You can't expect people to give money to sustain something JUST CAUSE, actually it's almost worst than that to be honest. There is nothing to be gained from that sort of investment. I see nothing wrong with building a new product if the old one clearly cannot sustain itself. At this point killing the game, but keeping up the forum (maybe for future brainstorming even) I'd imagine would cut SFO's maintenance cost significantly, which we could then relocate funds to create, like everyone is suggesting, a newer game. Even if it took a year or 2 of SFO being down, that's seems like a much more viable option than keeping this game alive. I agree. At this point the general census I'm getting (which I agree with) is that SFO no longer should be "sustained" rather 'Slashed, burned and rebuilt', No matter how long it takes. I also agree as for shutting down the game and its servers and like Latios said relocating the funds to build a newer more modern better game that will last PAST 17+ years. SFO has had the most amazing run for an Free Online Browser based 2001 Coded game to even last this long, and the community as well. The time draws nigh, I think we should just keep this forum and all who want to help suggest/brain storm on a next step for a new SFO game/Engine. If any of us really LOVE SFO and its a big or any way shape or form part of our live/s/childhood then we should realize its time is up and we should use this time/money/resources/community to raise from the ashes and create a new game. No. I didn't miss the point of any suggestion or post in the topic. What I didn't do was agree with any of them, or make a similar suggestion. Again, I understood. I just didn't agree with any one post within mine. Understanding does not equal agreement, nor does it have to. I also didn't ask anyone to continue donating to or supporting SFO in its current state, or dismiss any specific suggestion (except the unban suggestion). What you and LuXv miss is that I'm not in the same position as any of you, or any staff member who has posted in this topic. It's actually counterproductive (and misleading to the community) for me to co-sign what you're outlining as the only way forward. There's no dishonesty in that. Just wisdom and diplomacy. Titanium at this point you are arguing for the sake of arguing, as one of the most high ranked members of this community, you have already stated yourself that you have nothing really productive to add to this thread's discussion. Which is nothing to be ashamed of ofc, you brought professionalism and great moral leadership to SFO when it was demanded. At this point however status is merely a nuisance: we need to decide on an outcome for this game that we can all support. Killing the game without a full-fledged back up plan is the worst we can do, but burdening community with keeping a game alive is equally as bad in my eyes. We need to use whatever talent we have left here to try and build something bigger and better, i'm sure even among those of us still here there are folks more than capable of successfully creating a new SFO. Well here is where we shot outselves Total was somebody who could of rebuild the game. @Shiny~Latios , you're confusing a response with an argument. You continue to choose to respond to my posts based off of preconceived notions, and not what I actually say in my posts--possibly because you're still misunderstanding my actual points, or ascribing the meaning you think they have. Some advice: don't read more into my posts than what's actually there. I didn't come back to argue with you. I have no objections to any suggestions anyone wants to make (with the exception of the "global unban" fantasy solving anything). I'll still abstain from co-signing any specific suggestion because that's not what the community or TMyApp needs from me. Free yourself from the need to respond to my posts, my dude. Read them, but keep moving. Continue to brainstorm as you please. This will cease to feel like an argument when you, you know, stop arguing. You can't actively respond to my posts and then say I'm arguing for the sake of it when I respond to you. But you can choose to stop responding. Total was one of the best programmers. But he was not capable of rebuilding the game at the time he was let go. To say that he was is inaccurate and not helpful, to say the least. Alrighty then, so as a COMMUNITY what is OUR next step? What would make the most sense moving forward for this game? Right now (as of this moment) I would like for SFO 2.0 to cease from any future updates/bug-fixes technical support & we can transition into starting up a newer version FROM SCRATCH with a better engine. Todo this we would have to decide which engine would be the best moving forward (and seemingly has the best longevity) Our target Market (Casual Online Gamers I suppose) and Platforms we want our game to be on (Most likely still Web/DL version, although a Mobile App counter part would be dope). Then we would have to discuss Coders (unless TMyApp still wants todo the Majority if not all of the coding which I doubt would be practical) that we could either bring in/hire (pay with donations) or are already here in the community. Should we use this thread to brain storm the next steps after SFO 2.0 is 'retired" or "put to rest" or shall we keep pretending like this game still has hope in this climate? Because the FACT of the matter is, this Engine has been pushed FAR BEYOND its useful years and anymore work put into it would be counter-productive to a new engine. I KNOW people would rather donate towards a new engine than keeping SFO 2.0 servers up, just like how so many members donated during the "Dream Goals" era. Unless there are other options I'm not seeing at this moment that would be better and anyone could share with the rest of the community? Last edited by LuXv; 03-05-2018 at 09:28 AM. Lets assume the game had near zero glitches and was close to lag free as possible. The game was easy to open on all platforms. Hosting and challenging others were no longer an issue. Character and update releases continue based on donation goals. Staff and credible members periodically held events, tournaments, and clan battles. In my opinion, failing to bring in more players than the natural leaving rate is why SFO is on life support. To be honest, What else can SFO accomplish with it's current engine and current state? In august, 17 years running with over a million users and spanning an entire generation. I'm a sucker for narratives and it's definitely hard to say this but maybe it's time to go out a SUPER loud bang, streams, events, maybe a final character or donation campaign and have SFO leave the way it started... with an amazing legacy. Last edited by Noobkiller; 03-05-2018 at 11:29 AM. well.. after reading this thread. There is a plan which is on the official site, steps 1 and 2 were completed, a dedicated server will be implemented to solve host problems and stability in the game. The second step "the interface" raises modernity in the game. The third step is actually an advertising campaign to attract more people to the game. In my personal opinion I think that although the forum is something very important, it is also staying in the game and working together as in the old day. Last edited by Mil_TheAngel; 04-18-2018 at 01:17 PM. I agree wit Mil Angel, there's still hope in SFO to achieve another 17 years of fun and excitement after all 3 steps are completed. A good idea could be is: instead of calling this thread, "Final Funeral", let's turn this title into, "SFO Rises Up Once Again". I'm passing by and felt the need to place my 2 cents. I will say from now that you will probably not like what I'm going to say, but as they say, the truth hurts. First of all, SFO should have died a few years ago. When TMy confirmed that the new features he wanted weren't working, when he couldn't just "port" over SFO to the new shockwave engine, those should have been signs that it was the end. Because as pretty much everyone can agree, SFO cannot survive at all in it's current state. Everything has to be redone from the ground up. Allow me to put this in perspective. 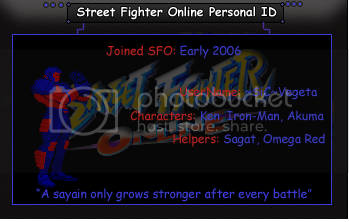 Let's start with when SFO first started(Back when it was called X-men vs Street Fighter). During this time fighting games were in a kind of limbo, a "dark age" so to speak. And back then, there wasn't much of a reliable way to play others from miles away. These factors, I believe contributed to the appeal of SFO. 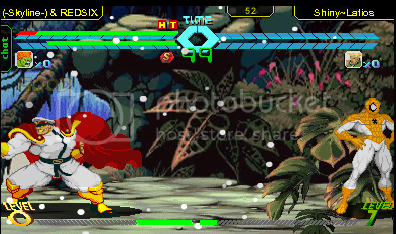 Being able to play something similar to the MvC days of old, for free on your browser? Fastforward several years later and SF4 created a resurgence in fighting games. Additionally, this was also around the time when online play began being embraced and started becoming more common. It was easier to connect to others and play your favorite games online. It was then that SFO was beginning to show its age. And then we have GGPO/Fightcade where people can play actual MvC (Legal issues aside) instead of an old laggy buggy version of MvC. Just passing by as well. I like this community and have good memories over the years. At this point I doubt the regulars actually like or play the game otherwise we would have more than 10 people on in a day. Because of that lack of activity it just discourages any one else who is thinking about trying out the new update or colour. The outdated engine actually hinders ease of access. I remember a few months ago I wanted to fire up SFO to see if I recognized anyone and I couldn't get it run past the loading screen on the web version. I don't know what the issue was but that basically killed my curiosity. I think the best thing to do is just keep the forums alive but I feel like that will pass too out of inactivity in a few years. It's not worth the investment if people like the idea of the community but not actively engaging in it. I know what it's like to keep a dying community alive as I've done it elsewhere. After countless updates, emails, pestering etc. it just has to be accepted. I issued a big bang announcement speech talking about some of the good times where everyone chimed in and we shut it down with a bang. At least this way it's a darling in our memories where we reminisce rather than seeing everything fade away into obscurity. The legends, the clans, the ranks, the late nights. It's in the past. Time to call it. I agree with Latios. But starting from scratch and rebuilding is no easy feat and very expensive. Not sure what kind of talent is here on the forum, and even if there how committed they are to developing something of this magnitude. As of right now, operational costs have not only been covered (we're in September now), but other project costs have been covered. For more, check out our last community update here. Donations have always been voluntary and SFO's player base are all adults in their 20s and 30s now. None of us have blinders on. We may be running on fumes, but we're still running and hoping to see better days. In a group sense, as a consensus, it's not really a question of whether to keep donating or stop donating. That's up to each individual, as always. If the consensus of many here is to let SFO die, then all you need to do is log off and wait for that to happen. And don't donate. If you would still like to support SFO, we could always use the help. Whether or not I agree with all points raised here, or feel they were the time and place (some of them, especially some remarks from staff members, were not appropriate) I understand them. Thank you all for what you've done for TMyApp and SFO, and for your opinions. This topic and discussion is now closed. If you would like to appeal this topic closing, contact me via PM at any time, or email me (my email is in my signature). Last edited by TitaniumFist; 09-09-2018 at 07:21 AM.